So you want to grow some grape vines? Perhaps you are interested in making wine, or perhaps you want to enjoy top-quality grapes for the table, picked right from your garden. Perhaps you like the idea of growing several varieties, so you can do both these things, as well as perhaps make some jelly, or enjoy fresh grape juice. Maybe you just like the romantic idea of sitting beneath a vine-covered arbor in summer, enjoying the shade and the beautiful foliage and hanging bunches of grapes. Whatever your reason, read on for some basic information about growing grape vines in your home garden. Grape vines grow best, and ripen their fruit best, in full sun. Consider that it is late summer and into fall when most varieties ripen, so make sure the lower sun at that time is not going to be blocked by trees or buildings. You need at least 8 hours of sun, and preferably more. Don’t plant in a low-lying part of the garden, as grapes like good drainage, so on a slope or a higher area is best. They are not particular about soil, and do well in poor, stony ground, but they don’t like wet feet. Grape vines are climbing plants, that need to be kept off the ground, so some kind of support is essential. In their natural setting these vines grow up into trees, but that is not practical in a garden – at least not if you want to be able to reach the fruit! A sturdy support is needed, and this could be almost anything, from a fence to a few wires stretched out. One beautiful way to grow grapes is on an arbor or pergola, trained across to provide shade in summer, and let the sun in in winter. 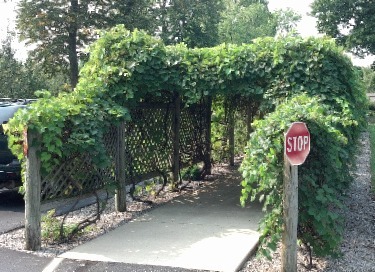 On a pergola you can plant one vine at each arch – a single vine from one side will cover the arch completely. If you have an arbor, plant a vine at opposite corners, or at each of the four corners if the arbor is large, that is, more than 10 feet across. If you have a sturdy, sunny fence, then that is an ideal place to grow grape vines. If not, you can grow them the way vineyards do, on wires stretched between poles. Drive some wooden or metal poles into the ground so that they are 5 or 6 feet tall, and strongly supported. The poles should be 15 or 16 feet apart. Then stretch two wires along them, one 5 to 6 feet above the ground, and the other 2½ to 3 feet above the ground. Use stretchers to tighten the wires, and allow you to tighten them later, as they usually stretch after a while. You can use this system to surround your vegetable garden, for example, or in a larger garden make several, to support a collection of vines. Space the rows 6 feet apart if you make several. If you are planting several grape vines, be sure to give them enough space. For desert grapes like Muscadine, plant 16 feet apart. For other types, 10 feet is sufficient, and some less vigorous varieties can be 6 feet apart. Grape vines are vigorous plants, that can and do grow very large. They can scramble 40 feet or more up a tree or engulf a fence. 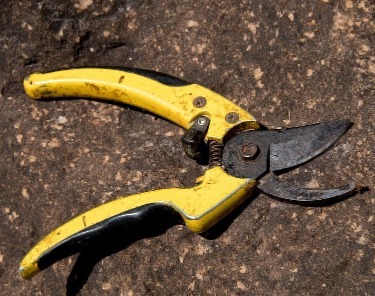 To control the size, and to produce the best crop, pruning is necessary. Don’t be put off, it isn’t difficult, but it may be different from pruning you have done before. The key idea to understand in pruning grapes is that flowers, and the grapes that follow them, appear on the new shoots that grow from existing branches. Since these new shoots can grow to 10 feet or more in a single season, the older parts of the plant are just a framework from which the new, productive shoots grow. This means that when pruning, the goal is to leave just a framework, not to preserve the growth from the previous year, which is now not needed – remember, we want to stimulate lots of new, fruit-bearing growth. Immediately you have planted your vines, prune them. The goal for the first year is to create a framework, not to produce grapes. What we are about to do sounds drastic, but it works. Cut back your plant to just a single, upright stem. Allow that stem to grow to just above the first wire. Use a cane to tie in to, so that it grows straight and upright. Once it reaches the wire, cut off an inch or two to make it branch out. Select two shoots near each wire, and train them along the wires, in both directions. These will form the permanent ‘arms’ of your plant. Some growers grow just two arms, along the lower wire, and use the upper one to support the new shoots. Others use 3 wires and create six arms. The choice is yours, and less-vigorous vines can be best grown with more arms, while vigorous ones have fewer. The next year, continue developing the arms if necessary, and tie in any new shoots along the wires. From now on, every spring, you will completely remove all the shoots from the previous year – the ones that had grapes – back to within a couple of inches of the framework. If a framework branch has died, or become old and unproductive, replace it with a new shoot. With vigorous vines, this pruning will remove a lot of material, but don’t worry, the harder you prune the better the quality of the grapes. Under-pruned vines produce a lot of grapes, but they will be small and of low quality. 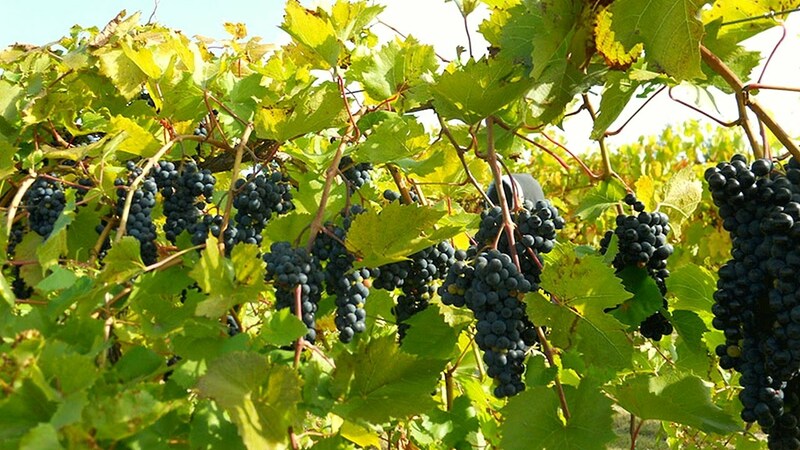 The ideal is for an established vine to have 20 or 30 buds left after pruning if it is a wine variety, and 40 to 60 buds for a table or jelly variety. Most of these buds will produce a short shoot, with leaves grapes on it, and some will produce longer growth with mostly leaves that will feed the plant. Young vines are heavy feeders and putting compost over the roots in spring in the best, and most natural, way to feed them. Keep the ground free of grass and weeds, and don’t use a mulch, as grape vines like warm soil. If you live in a colder area and you are having trouble ripening your grapes, remove a few of the leaves around them, to let more light and sun in. Table grapes may produce very large bunches, with so many grapes in them that they remain small. For large, top-quality eating fruit, use a pair of sharp scissors to snip out some of the berries when they are small, so that the remaining ones grow larger. Growing grape vines is a great thing to do in your garden. The simple care is enjoyable and a learning experience, and the results – beautiful table grapes, home-made jelly, or your own home-made wine – are all worth the small effort involved. Enjoy your home vineyard.